Director of Instructional Technology for the Grossmont Union High School District. We are still in the development phase of our five OER high school projects – biology, space and earth science, chemistry, world history, and economics. However, the process of exploring the content and appropriate teaching strategies has given all of our teams new and more profound insights on their subject areas. In both science and social studies, new California state standards have provided an opportunity to rethink curriculum. This is especially true in science. Next Generation Science Standards (NGSS) take a radically different approach to teaching science. The science teams have spent considerable time looking at instructional practices to complement the content they are curating. This is helping the Grossmont Union High School District define how we will bring NGSS into all of our science classrooms. While we developed a general set of guidelines and timelines, we have allowed each of the five teams the flexibility to approach the process in the way that best suits the team dynamic and members. We discovered early on that our science teams needed to go well beyond resource curation. While the science resources are plentiful, including vetted textbook-style materials at CK-12, they needed to create sample units and detailed lesson plans to visualize and embrace the instructional needs of NGSS. In our two social studies teams, we face a different challenge with a lack of well developed textbook-style materials. As a result, both the world history and economics teams have spent a significant amount of their meeting time building that foundational resource. Additional supplemental and teaching resources will come at a later developmental phase for these teams. I value the willingness of the participating teachers to give their time and expertise to this project. The sense of community each team has developed and the opportunity for collaboration across all of the schools in our district are creating a foundation that will allow us to push instructional practices to the next level. I wish people understood that it is not just a free, online textbook. OER Is a state of mind. It deliberately and systematically harnesses the power of the internet. The development of openly licensed materials is an opportunity to build a new context to help us break out of a system of misguided standardized tests and teacher-centered classrooms. It ensures that our students continue to get vibrant and relevant resources while rethinking and reworking instructional practices. This movement empowers teachers to customize the learning experiences that reflect the needs of today’s students. Dan McDowell is the Director of Instructional Technology for the Grossmont Union High School District. 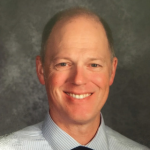 He has led the district FutureForward initiative to modernize teaching practices through a 1-1 Chromebook program, ongoing professional development, and the development of openly licensed materials. Prior to this role, he taught the Social Sciences and Photography at West Hills High School for 18 years and, in 2008, was selected Teacher of the Year for the Grossmont District. He earned an MA in Educational Technology from San Diego State University and now teaches graduate-level courses in that department. He is a Google Certified Innovator and has led 300+ workshops and presentations focusing on the integration of technology at the district, county, state, and national levels. Dan also served on the Public Broadcast Service (PBS) Teachers advisory board for five years and writes web-based curriculum for PBS Learning Media. More information about Dan and links to specific projects can be found at danmcdowell.net.